Starting off with modern powertrains in cradle frames, doing away with the ugly factory body panels, useless gizmos and under-performing components, adapting our own parts to create machines envisioned by past racers. 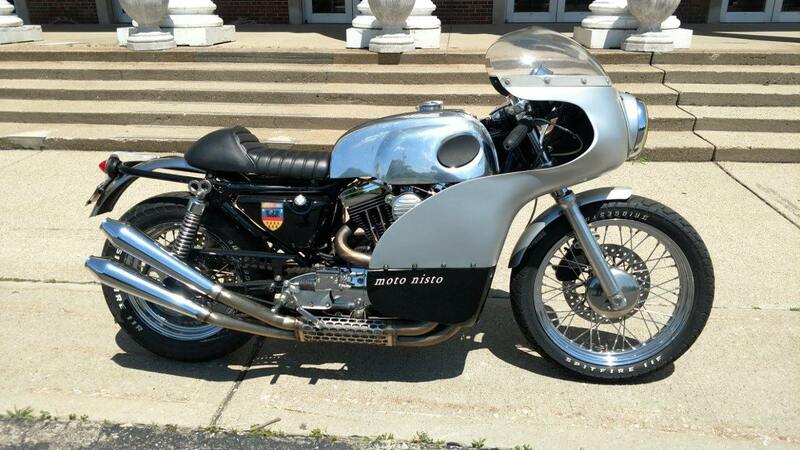 We meld functional and reliable motorcycles of today with the class and style of decades ago. Each motorbike is crafted with undivided attention, not mass-produced by a union to meet the visions of a corporation and requirements of a government, only to be sold to massive crowds that lack individuality and culture. 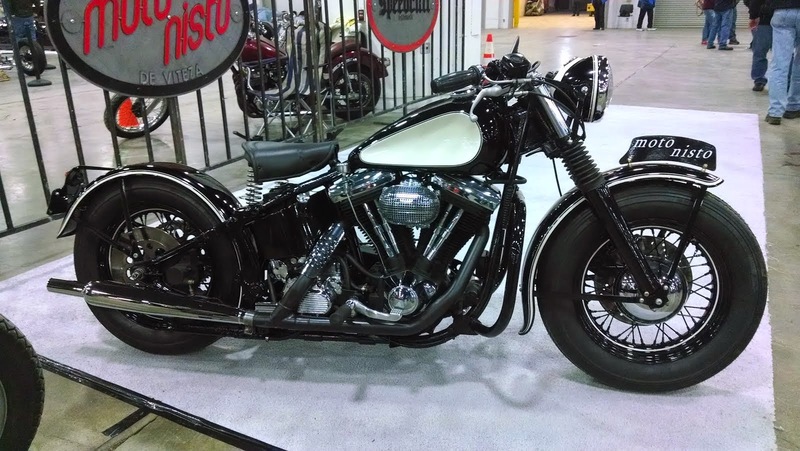 For those reason, we like to start off with a Harley- Davidson Sportster as a blank canvas and strip off everything it stands for. What do we like about it? Mostly the air-cooled, unit engine in a cradle frame. Time proven, simple, reliable, honest performance, no-maintenance valvetrain, ground clearance, parts availability, inexpensive. What don't we like about it? EVERYTHING ELSE! That includes the people who like everything else. We have the right to refuse service to anyone, for any reason. Or no reason at all. This is not our breadwinner. We only build bikes and parts out of love, as a hobby, for customers who truly deserve and appreciate them. The same goes for our T-shirt, we don’t want to see it worn on a chopper by some goofball, only cool people please, and we decide who is cool or isn't! But if you are still on this page chances are you're cool and smart and classy and totally awesome, so go ahead and order one, you might be lucky too! Q: How fast are your bikes? A: Faster than your average Harley or car, but not as fast as foreign superbikes. Definitely fast enough to outrun that pesky dog chasing you, and more fun to ride it than getting caught. Fast enough to get you in trouble with the law, but not fast enough to get you arrested and make the news. Q: Do they handle and brake well? Q: I have a GSXR, want to race for pinks? A: My neighbor has a ZX14, I’ll pass him your info. Q: I’ve outgrown all of my Harley-Davidson T-shirts, can I purchase one of yours to wear on my special edition, 105th anniversary Dyna Glide? 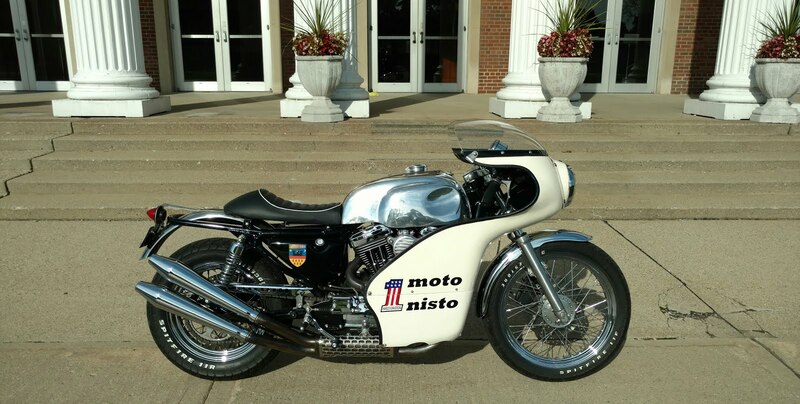 Q: Can I pick my own paint color and graphics if I hire you to build me a bike? A: Only if we approve of it. Color, maybe. Graphics, probably not. Q: Are your bikes street legal? A: Yes, in most countries except the 4th Reich of California. Of course, if you're unfortunate enough to live there, you might still be able to sneak one across the border and hope its Nazi officials don't notice it in the sea of choppers. Q: I’ve heard that, just like your bikes, your T-shirts are bulletproof. Is it true? Q: How expensive are your bikes? A: They aren’t cheap, but are not as expensive as your house, unless yours has wheels on it. Q: I already have a Sporty, can you just modify mine? A: Yes (preferred), if you can drop it off and pick it up, or arrange shipping. Q: Are your body panels made of fiberglass? A: No, all steel, but still lighter than your boots. A: Where’s the question, moron? You are prohibited from talking to us again. EVER! Q: Are your bikes comfortable? A: If you are 5’8” - 6’2” tall, weigh no more than 230lbs, have all of your limbs and don’t menstruate, you'll be OK on one for 500-800 miles a day, more if you’re on drugs, less if your other vehicle is a sofa. A: 3 - 6 months, depending on your wealth and motorcycle complexity/options such as fairing, instruments, turn signals etc. Q: If I need replacement parts, whom do I contact? A: Parts with Harley-Davidson part-numbers are available at most bike shops. All others are available through us. Q: I like your bikes, can I have one? A: When you give me your mommy's checkbook. Q: Is Ducati your inspiration? A: Only for the half-fairing. A: …and for all the right reasons, you cretard! 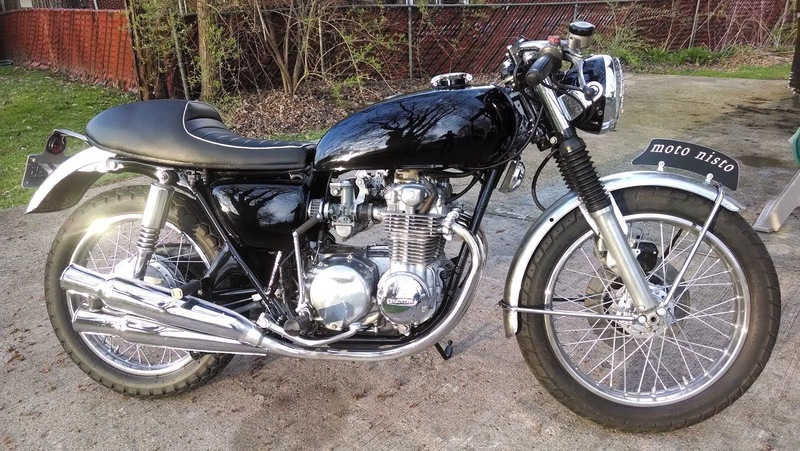 Q: Could you turn my '77 CB750 into a cafe racer? A: Yes, we can work on any bike, yours being one of the easiest to transform with plenty of aftermarket goodies for it. However, it will be cheaper to do it yourself with parts readily available elsewhere online or swap meets. 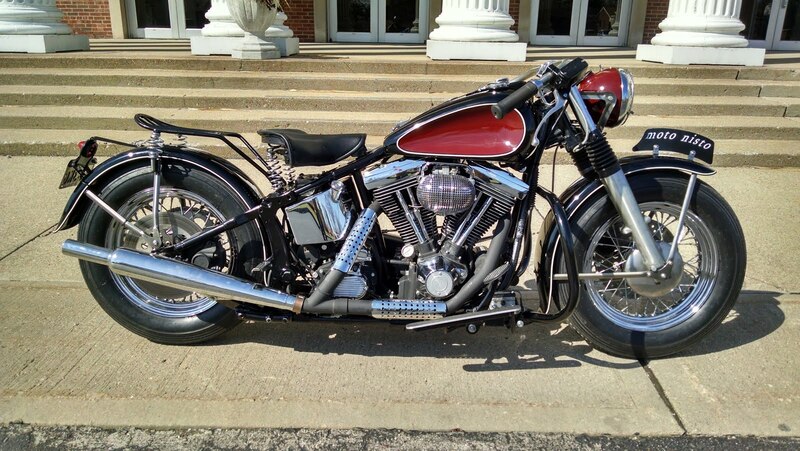 That's another reason I prefer Sportsters, not much competition out there. 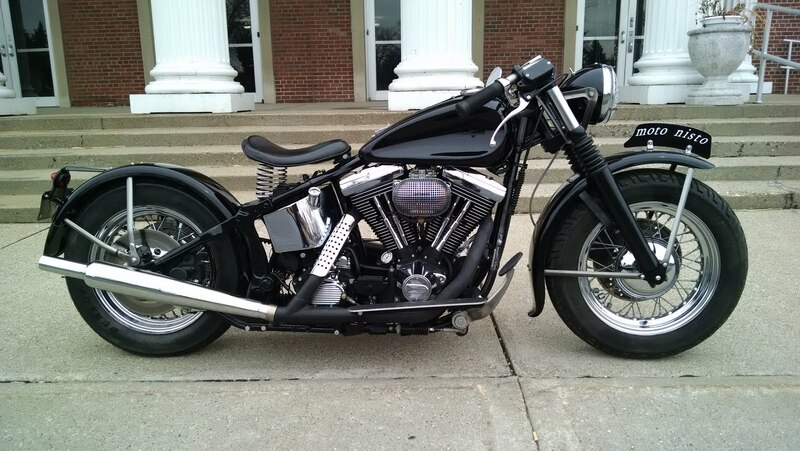 Q: Can you make a café racer from my 2006 Road King? A: You can’t make beautiful art starting with a crappy canvas. Q: I’m happy with my stock Harley. A: Good for you, so are the other million Hog owners! 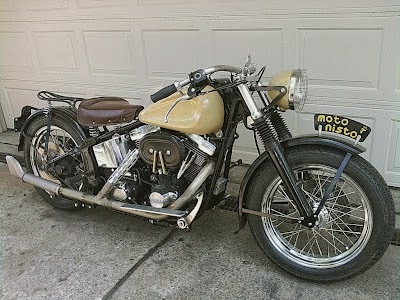 Q: Do you sell kits I can install on my Sportster by myself? A: Not really, nothing bolts on directly, frame must be modified and welded on, wires and electronics relocated, etc. The instructions book coming with such a kit would decimate our forests, yet not including one would be depriving you of most hair follicles, joyous riding years and happy marriage(s). 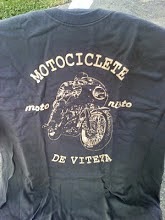 However, a gentleman (very awesome guy, worthy of wearing our T-shirt) makes kits for older Sportsters (and other models), and you can find them at www.benjiescaferacer.com. Q: Do your bikes come with some sort of warranty? A: Hmm, good question, finally. It depends - if you're paying us (U.S.) $100K to build you one, we'll provide you with a lifetime warranty on anything that breaks. If we only charge you $10K to modify your own bike, we only guarantee our own parts or the pre-existing ones affected by the installation of ours, for 24 (metric or U.S.) months or 60K (U.S) miles, whichever occurs first. Yes, 60K miles in 2 years, we expect you'll ride it since it will be your favorite bike! Q: How would payments have to be made? A: Another good question. A predetermined amount would be paid upfront in order to cover our butts and gather materials and supplies, the rest paid after final customer approval but before customer test drive.